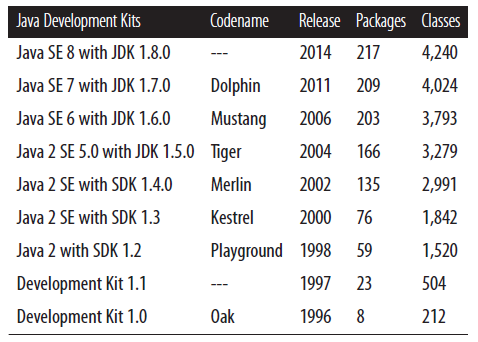 How many classes are there in Java standard edition? I am curious how many classes are there in Java standard library. Perhaps someone knows an approximate number? * Javadocs prior to 5.0 are now offline. I see 3793 counting interfaces and abstract classes, as well as private classes. I deleted two lines related to the manifest (and thus not representing a class). I believe that the other lines all refer to classes, but I did not do an exhaustive check. Then I went to the bottom of the file and emacs told me that there 17,338 lines. This includes stuff like: java/io/ObjectOutputStream$1.class. Calculating classes and subclasses is a cumbersome task, but you can know the number of files. 4240 total files in Jdk 8. Click here for the list of all files. According to the API documentation 3793 including abstract classes and interfaces. For Java SE 9 , according to the API doc 6005 including abstract and interfaces. For Java SE 10, according to the API doc 6002 including abstract and interfaces. Method : view source, and count "<li>" html tag with notepad++. For Java SE 11, according to the API doc 4411 including abstract and interfaces. For Java SE 12, according to the API doc 4433 including abstract and interfaces. What are the immutable objects other than String inside Java?